From the entire South Indian breakfast menu, if there is something I absolutely love, it’s Rava Dosa. The Rava dosa is my knight in shining armour whenever nothing is planned for the breakfast and I have to serve something instant and delicious. Hence, instant Rava dosa is one of my favourite recipes for the easy to follow instructions and the crispy dosa it yields every time. 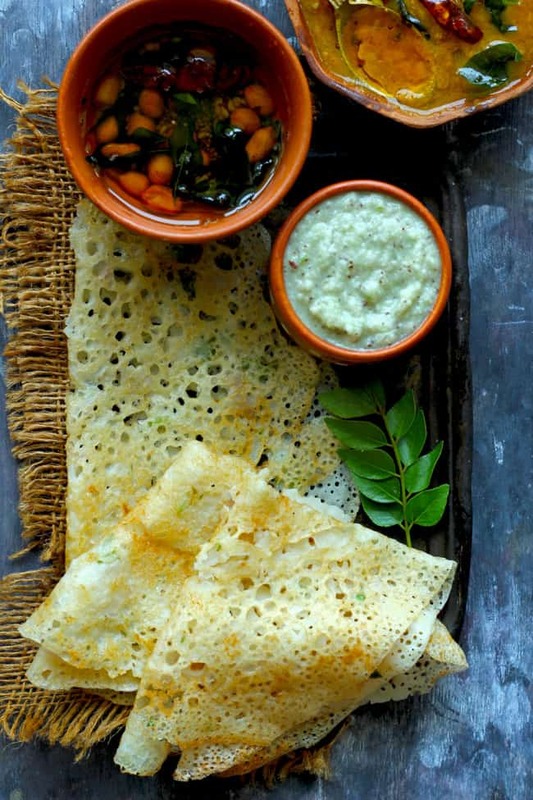 With a homemade coconut chutney and sambar, Rava dosa is a totally blissful breakfast. When I was in Chennai, I had some of the best Rava Dosas at Saravana Bhavan and Sangeetha and it is love at first bite. For a great part of my life, I hadn’t realized how easy it is to make rava dosa at home. One need to spend such such little time in the kitchen for the preparation. The Instant Rava Dosa batter does not require any fermentation or grinding which makes the recipe one of my favorites. The best part about the paper thin rava dosa is that it is so light that you won’t feel full even after relishing one full dosa. If anything, you will want to have more. The next best part (yes, there are two best parts!) is that it can easily be customised according to your preferences. 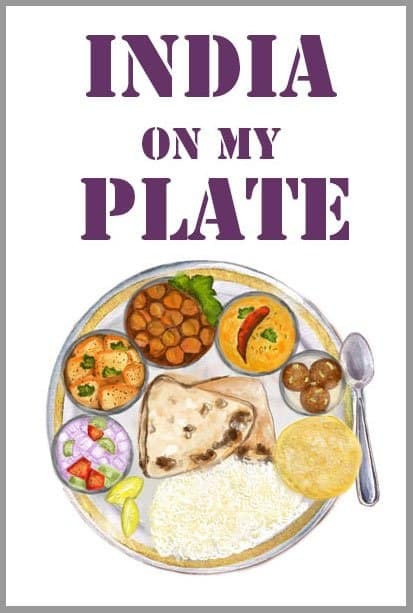 It can be filled with South Indian style potato masala or just fried onions or cottage cheese and to serve it as a tea time snack, it can be left plain with no filling. Serve it with hot sambhar or nariyal chutney and you are golden. However you decide to serve it, Rava dosa tastes like heaven. The crisp Rava dosa mixed with cold chutney creates a pleasurable combination for the taste buds. 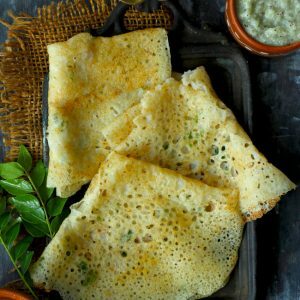 Pro tip: Have them while they are hot and fresh from the pan because otherwise, rava dosa loses their signature crispy texture. After going through a lot of recipes by different authors, I have finally zeroed down on this recipe. It’s extremely easy and will give you the perfect instant Rava dosas if followed correctly. 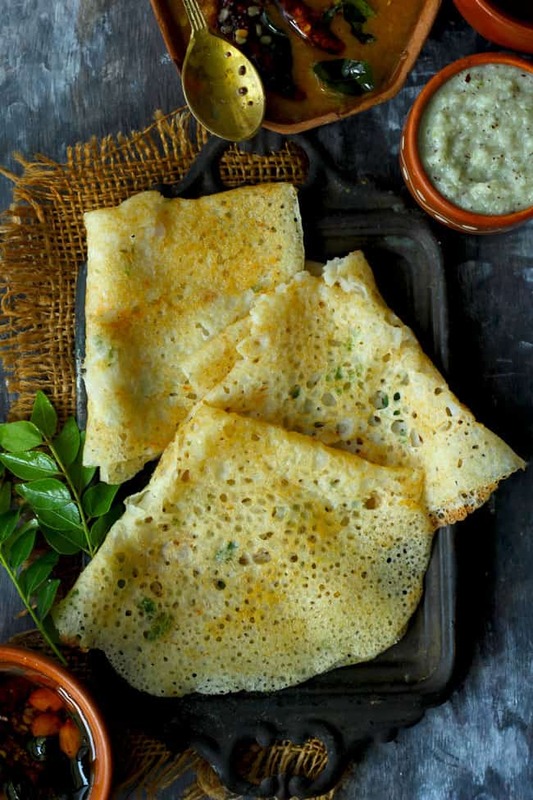 With a homemade coconut chutney and sambar, Rava dosa is a totally blissful breakfast. Combine maida, rice flour, rava, salt in a bowl. Add water and make a very thin batter. The consistency of the batter should be like buttermilk. Add black pepper, curry leaves and coriander leaves. Mix nicely and set batter aside. It is best to rest the batter for 10 - 15 minutes. Heat a non stick dosa pan over high heat. Pour one or two ladleful of batter on the pan so that it forms like a web with big holes. Do not spread the batter like regular dosa. Simply pour it over the pan. Drizzle a teaspoon or so of ghee/oil on the sides of the dosa. Do not flip the dosa. Let the dosa turn crisp and golden from one side. Once done, it's edges would leave the pan. Flip the dosa and cook fro 1 - 2 minute from the other side. 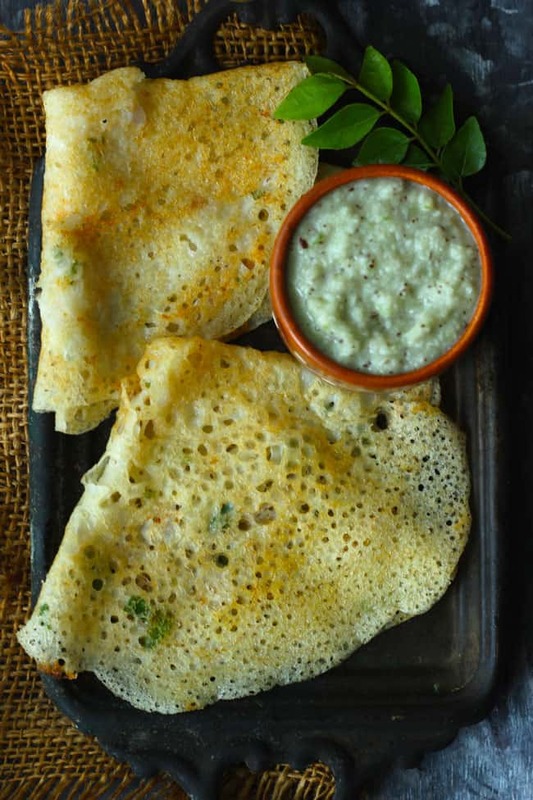 Fold and serve instant rava dosa immediately.